Confessions of a Fairy’s Daughter | What Next? Without a doubt Confessions of a Fairy’s Daughter was the best show I saw at the Winnipeg Fringe Festival this year. It engaged me completely and left me in tears. Alison Wearing is a gifted writer and captivating story teller and in her Fringe show she uses photographs, music and movement to share her memoir. When she was twelve Alison learned that her father, a Trent university professor, was gay and was moving out of their home. It certainly wasn’t easy for a young adolescent girl in the 1980s to adjust to such a major change in her family life but Alison tells her story without a sense of victimhood. 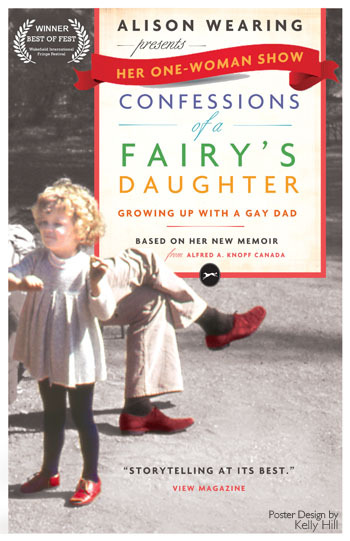 Her mother supported Alison’s father in his desire to continue to play a major role in their children’s lives, something commendable when one considers that it wasn’t till 1996 that the federal government passed Bill C-33 which added discrimination on the basis of sexual orientation to the Human Rights Act making it illegal in Canada. In two successive anecdotes about Christmas, Alison suggests sometimes life was more normal and traditional with her Dad than with her Mom. Alison loves both her parents and speaks with pride of their gifts and accomplishments as well as her gratitude that they have allowed her to share their family’s story so publicly. She clearly admires her father’s courage in ‘coming out’ when he did and is glad he has found happiness in a partnership with another man that has lasted for many decades. Her stage play is a re-telling of the first section of her book published by Alfred Knopf. I am looking forward to reading it. As a teenager Alison went to great lengths to hide the fact her father was gay. She expressed her happiness that times have changed so much her own son doesn’t have to give a second thought to his grandfather’s sexual orientation and can talk about it freely. I saw the last performance of Alison’s show in Winnipeg but she is moving on to the Saskatoon Fringe and if you live there I encourage you to go.